In a time where fake news is difficult to discern and rapidly spreads, teachers have the unique opportunity to positively encourage and engage students to make critical thinking a routine part of daily media consumption. Although media literacy can be a challenge to teach, it’s an important one to take on. No matter what you teach, there’s always an opportunity to give students the tools they need to verify information and navigate the ever-growing minefield of click-bait, sensationalism, and fake news. 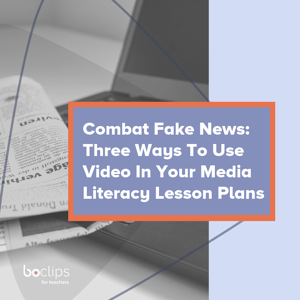 By teaching students how to evaluate and filter information from media sources, you are laying a foundation for a lifetime of critical thinking Consider using video in three key ways as part of your media literacy lesson plans. One of the top ways to spot fake news is to look for different sources that cover the same circumstances or event. Though many sources may report differently on the details, they often tell the same overall story. Select a relevant topic and find a few videos from different sources on that subject. Watch the videos with your students, and have them compare how each source covered the issue. Ask them to write down the key facts mentioned. Consider using a Venn diagram so students can visually see how some facts may overlap, while others may only be mentioned in one or two stories. By looking at multiple sources, students will not only be able to see the topic from a few different angles, but they will gain a better overall perspective of how only using one source to verify facts can sometimes leave out important details. If it seems too good to be true, it probably is. Misleading titles and headlines of videos and news stories are meant to be engaging and enticing, and they are made to make you click. Have your students evaluate the headlines and titles of a few select videos by discussing or writing down what they think a particular video will be about. Then, have them watch the videos. Ask students if the headlines matched the content of the videos, and discuss the potential consequences of sharing news or unverified sources based on headlines alone. Where a piece of information comes from can be just as important as the information itself. Select a variety of videos from a few different sources, and have students evaluate the overall reliability of each source. Are they familiar with it? Is it a legitimate source? Has this source been dependable in the past? What would make you trust this source over another one? By asking these types of questions and evaluating the type of content a source posts, students can gain a better understanding of how to choose reliable sources, and a feel for how to weed out the inaccurate ones. Beyond teaching your students how to discern fake news, the increased spread of fake news can make it tougher for you to find vetted, quality educational videos. With Boclips, educators can cut through the clutter and access over 1 million video clips, aggregated from reliable, globally recognized content providers. Access educational content free from distractions and inappropriate content. Click here to learn more. Join the Teacher Community and get involved!